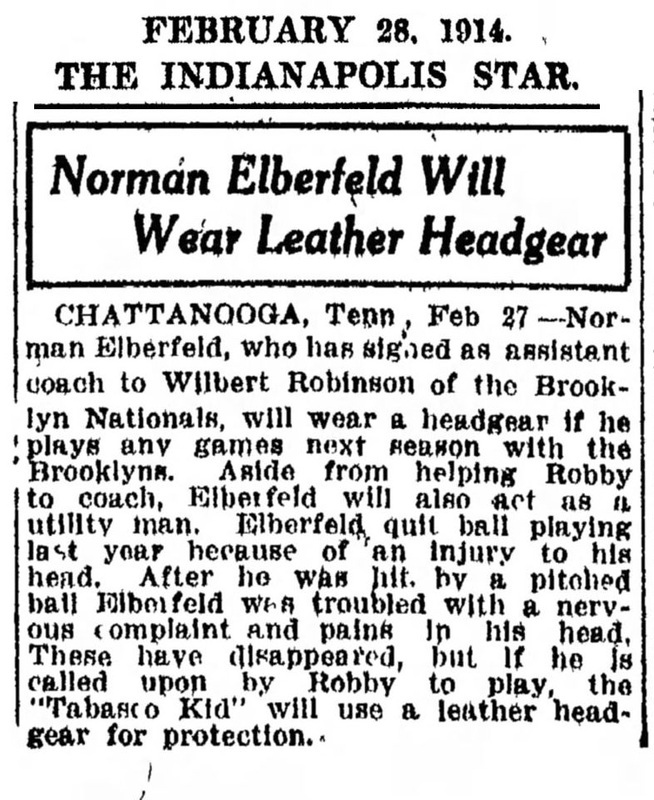 CHATTANOOGA, Tenn , Feb 27 —Norman Elberfeld, who has signed as assistant coach to Wilbert Robinson of the Brooklyn Nationals, will wear a headgear if he plays any games next season with the Brooklyns. Aside	from	helping	Robby to	coach,	Elberfeld	will	also	act	as	a utility	man. Elberfeld quit	ball	playing last	year	because	of an	injury	to	his head. After	he was	hit by	a	pitched ball Elberfeld was troubled with a nervous complaint and pains in	his	head, These	have	disappeared,	but	If	he	is called	upon	by	Robby	to	play,	the "Tabasco Kid" will use a leather headgear for protection.